Neurologic music therapy (NMT) is the therapeutic application of music to cognitive, sensory, and motor dysfunctions that come from human neurologic diseases. NMT treatment is based on stimulating music perception and production parts in the human brain, and the effects thereof on nonmusical and behavior functions. The targeted neurological dysfunctions include stroke, traumatic brain injury, Parkinson's disease, Huntington's disease, cerebral palsy, Alzheimer's disease, autism, and other neurological disease affecting cognition, movement, and communication (e.g., MS, muscular dystrophy, etc.). Here are seven common neurologic dysfunctions categorized into one of four domains that are motor, sensory, cognitive, and communicational dysfunctions. 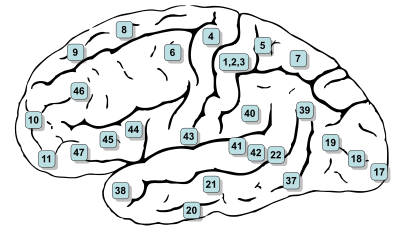 For each dysfunction, specific parts of the brain are impaired, and the corresponding locations of the brain are denoted with Brodmann area numbers. In neuroscience, a Brodmann area is a conventional way to express different regions of cerebral cortex based on diverse cortical functions. Motor dysfunction involves malfunctioning of the nervous system controlling muscles and movement of body. There are different kinds of motor dysfunctions to which neurologic music therapy can be applied with beneficial results, and the dysfunctions include stroke, Parkinson's disease, Post-encephalitic, Huntington's disease, and aphasia. For stroke patients, the motor circuit has a difficult time being activated by itself. Using music-supported therapy, their motor circuit can be co-activated along with auditory cortex. This therapy is based on neuroplasticity, the capacity of brain to induce plastic changes and repair damaged brains of adults. After brain damage, new neuronal connections and pathways can be built, reshaped, and rewired. Music-supported therapy has been developed recently to improve the upper extremity function of stroke patients. Patients learn to play electronic pianos and electronic drums, each instruments serving as a training method for fine and gross movements. An intensive one-month program is conducted on stroke patients which teaches them to move their upper extremities in sync along with the song. After finishing this program, chronic stroke patients showed significant motor improvements in Action Research Arm Test, which is one of the most widely used measures of upper extremity function. There was partial re-establishment of the default dynamics of the motor circuit, and this is induced by auditory-motor network co-activation. Also, after finishing this program, the trained song was played to these patients, and researchers studied fMRI activation of the brains. From this fMRI study, researchers discovered bilateral activation of both auditory and motor circuits. Mean functional connectivities were calculated within the audio-motor network for pre- and post-experiment, and there is a clear increase in connectivities between the auditory network and the motor network. Stroke patients can improve on initiating movements by music-supported therapy which utilizes auditory cortex for co-activation of motor circuit system. Enriched acoustic stimulus within the frequency region of the hearing loss may prevent tonotopic reorganization in auditory cortex by compensating for the decrease in firing rate caused by the hearing impairment. An experiment was done on cats to prove rescue effect of enriched acoustic environment from hearing loss. Fourteen short-hair, wild-type cats were exposed to a traumatizing noise of high frequency around 40 dB for two hours as an experimental group. As a result of the exposure, significant damage is observed in the high frequency region of cochlea. There are auditory nerve fibers connecting this high frequency region to corresponding auditory cortex in the brain, and the firing rates of these auditory nerve fibers in the high frequency region significantly decrease due to cochlear damage. This decrease in firing rates shifts the cortical tonotopic map toward a lower frequency range. This reorganization of cortical tonotopic map can result in tinnitus or phantom sound. After this impairment, half of the cats were placed in a quiet room, and the others were placed in a room with enriched acoustic environment. In enriched acoustic environment, the cats were stimulated with high-frequency multitone complex stimulus. They were exposed to this environment 24 hours/day for 35 days, and results were compared. This is where enriched acoustic environment comes into play. Enriched acoustic stimulus within the frequency region of the hearing loss may prevent tonotopic reorganization in the auditory cortex by compensating for the decrease in firing rate caused by the hearing impairment. This compensation did not happen for the control group placed in the quiet room, and hearing loss is inevitable. Human hearing loss at a certain frequency can be treated by gentle stimulation of acoustic sound at that pitch. Mobile music touch, developed by Dr. Starner and his Contextual Computing Lab at Georgia Tech, is an innovative wireless glove paired with a computer or mp3 player to help regenerate dissipated nerves. As this mobile music touch system plays a song, five vibrators on glove are tapping the fingers using vibration motors to indicate each key on the piano keyboard. Usually, learning requires active attention, but professor Starner came up with a concept called Passive Haptic Learning. Haptic includes both tactile sense and proprioception, and this passive learning is, potentially, applicable for all other somatosensory senses. What distinguishes Dr. Starner's mobile music touch from all other therapeutic interventions is the passive nature of this therapy without the following general requirements of learning which are attention, hard practice, and motivation. The mobile music touch has a potential clinical application. Dr. Starner works with Shepherd Spinal Cord Center for patients with partial tetraplegia. They are patients with all four limbs partially paralyzed, mostly from spinal cord injury. In one study, patients were wearing this glove two hours a day, five days a week, for eight weeks. After eight weeks of therapy sessions, a significant improvement was observed on somatosensory sensation of their hands especially on 'grasp and release' test which supports the improvement on motor system. This experiment supports that passive learning is possible and can be effective. This therapy is still in the process of research, and PET scan or imaging studies have not been done yet. However, Dr. Starner has preliminary hypothesis for neural mechanism. As the glove sends the vibrations repeatedly to the paralyzed hand, the brain may be recruiting more neurons to explain these random somatosensory signals. Stimulations result in more activations. At the same time, there may be a mirror neuron effect. While vibrations move the fingers and stimulate our somatosensory neurons, there is firing of motor neurons mimicking the movement of the hand caused by vibration. Repetitive stimulation of vibration rejuvenate degenerated tactile sensory system. The cognitive dysfunction involves impairments of nervous systems managing intellectual functions such as thinking, reasoning, planning, and remembering. Communicational dysfunction involves impairments of nervous systems handling communication abilities such as speech, language, and auditory processing. In the realm of neurologic music therapy, cognitive rehabilitation is, compared to the other domains, the newest domain that has recently been getting major attention by research and clinics. Music therapies below are applied to the speech processing system and the memory and recall system of the brain. One of the most-studied communicational dysfunctions is aphasia. Aphasia is dysfunction characterized by loss of ability to communicate verbally. Largely, there are two main category of aphasia, and they are expressive aphasia and receptive aphasia. Expressive aphasia, loss of spoken language, results from damage or dysfunction in left frontal lobe, especially Broca's area. Receptive aphasia patients have difficulty understanding speech, and it is caused by damage or dysfunction in Wernicke's area, a different speech area in the left temporal lobe. An interesting characteristic about Broca's aphasia patients is that the patients are not able to make meaningful propositional phrases, but, often, they are able to sing along to their familiar tunes. Based on this intriguing tendency, Melodic intonation therapy was developed. Melodic intonation therapy contains two essential components of melodic singing and rhythmic tapping of each syllable. Patients start with singing short intoned phrases, and intonations are gradually removed to normal speaking level. There are many studies that examined the neural mechanism of this therapy, but it has not been firmly agreed upon yet. However, the possible neural mechanism boils down to two routes to recovery. First, for patients with small lesions in the left hemisphere, there tends to be more activation in the left hemisphere around the lesions and small amount of right hemisphere activation. Second, for patients with large lesions in the left hemisphere, there tends to be more activation of right Broca's area, the Broca's area in the right hemisphere. Songs are promising to treat expressive and receptive aphasia patients by activating speech part of the brain through melodic and rhythmic notes. Dementia is one of the most prevalent cognitive dysfunction. Interestingly, even when dementia is very advanced, the patients succeed to respond to music. The patients can often respond to familiar melodies and are able to sing along. They can also recognize when the original melodies are distorted. Dementia can result from different causes, but Alzheimer's disease is the most common cause. Memory is enhanced when it is accompanied by emotional context, and music is a powerful stimulus for various emotions. The hippocampus network is the part of the brain that manages memory forming, organizing, and storing. However, when Alzheimer's disease patients are using short term memory, the amygdala network gets activated rather than hippocampus network. The activation of amygdala network, the network that processes emotional memory, signifies that emotion is a critical factor for short term memory of Alzheimer's disease patients. Memorization performance and EEG record support the idea that song rehearsal for multiple sclerosis is an effective therapeutic intervention for improving memory, by activating the bilateral frontal lobe. Music is organized with a highly developed temporal structure, and it functions as a powerful metric template organizing and chunking information. This well-organized information is easier to process for patients with memory disorders. For multiple sclerosis patients, memory dysfunction is one of the main cognitive symptoms. To help this memory problem, a strategy similar to melodic intonation therapy is applied, and patients rehearse the list of words embedded in the song. As a result, the patients showed much better memory performance compared to spoken rehearsal patients.Electroencephalography (EEG) records support the hypothesis that song rehearsal is more effective than spoken rehearsal. When EEG was recorded to examine neural activity of both a music rehearsal group and a spoken rehearsal group, the music rehearsal group showed significantly higher activation in the bilateral frontal lobe, where memory is processed. The temporal sturucture of music and emotion invoked my music are essential mechanisms for patients with memory disorders. A board-certified music therapist who is professionally trained according to the standards of their country must complete a foundational training in neurologic music therapy and may use the professional designation of NMT to become a member of the Academy for three years. Completion of the NMT training allows the board-certified music therapist to practice and use the credential of NMT. 1 2 3 Thaut M. "Robert F. Unkefer Academy of Neurologic Music Therapy". The Center for Biomedical Research in Music at Colorado State U. Retrieved 2 August 2011. ↑ Thaut M (1999). Training manual for neurologic music therapy. Colorado State University: Center for Biomedical Research in Music. ↑ Hackney ME, Earhart GM (2009). "Effects of dance on movement control in Parkinson's disease: a comparison of Argentine tango and American ballroom". primary. Journal of Rehabilitation Medicine. 41 (6): 475–81. doi:10.2340/16501977-0362. PMC 2688709 . PMID 19479161. 1 2 3 4 Rodriguez-Fornells A, Rojo N, Amengual JL, Ripollés P, Altenmüller E, Münte TF (2012). "The involvement of audio-motor coupling in the music-supported therapy applied to stroke patients". primary. Annals of the New York Academy of Sciences. 1252: 282–93. doi:10.1111/j.1749-6632.2011.06425.x. PMID 22524370. 1 2 3 4 5 Noreña AJ, Eggermont JJ (2005). "Enriched acoustic environment after noise trauma reduces hearing loss and prevents cortical map reorganization". primary. The Journal of Neuroscience. 25 (3): 699–705. doi:10.1523/JNEUROSCI.2226-04.2005. PMID 15659607. 1 2 Huang K, Starner T, Do E, Weinberg G, Kohlsdorf D, Ahlrichs C, Leibrandt R (2010). "Mobile Music Touch: Mobile Tactile Stimulation For Passive Learning". Chi2010: Proceedings of the 28th Annual Chi Conference on Human Factors in Computing Systems. 1–4: 791–800. 1 2 3 Cuddy LL, Duffin J (2005). "Music, memory, and Alzheimer's disease: is music recognition spared in dementia, and how can it be assessed?". primary. Medical Hypotheses. 64 (2): 229–35. doi:10.1016/j.mehy.2004.09.005. PMID 15607545. 1 2 Thaut MH (2010). "Neurologic Music Therapy in Cognitive Rehabilitation =". Music Perception. 27 (4): 281–285. doi:10.1525/Mp.2010.27.4.281. 1 2 3 Schlaug G, Marchina S, Norton A (2008). "From Singing to Speaking: Why Singing May Lead to Recovery of Expressive Language Function in Patients with Broca's Aphasia". primary. Music Perception. 25 (4): 315–323. doi:10.1525/MP.2008.25.4.315. PMC 3010734 . PMID 21197418. ↑ Rojo N, Amengual J, Juncadella M, Rubio F, Camara E, Marco-Pallares J, Schneider S, Veciana M, Montero J, Mohammadi B, Altenmüller E, Grau C, Münte TF, Rodriguez-Fornells A (2011). "Music-supported therapy induces plasticity in the sensorimotor cortex in chronic stroke: a single-case study using multimodal imaging (fMRI-TMS)". primary. Brain Injury. 25 (7-8): 787–93. doi:10.3109/02699052.2011.576305. PMID 21561296. 1 2 3 4 Markow T, Ramakrishnan N, Huang K, Starner T, Eicholtz M, Garrett S, Profita H, Scarlet A, Schooler C, Tarun A, Backus D (2010). "Mobile Music Touch: Vibration stimulus in hand rehabilitation". Pervasive Computing Technologies for Healthcare. PervasiveHealth: 1–8. 1 2 Belin P, Van Eeckhout P, Zilbovicius M, Remy P, François C, Guillaume S, Chain F, Rancurel G, Samson Y (1996). "Recovery from nonfluent aphasia after melodic intonation therapy: a PET study". primary. Neurology. 47 (6): 1504–11. doi:10.1212/wnl.47.6.1504. PMID 8960735. ↑ Rosenbaum, R. S., Furey, M. L., Horwitz, B., & Grady, C. L. (2010). Altered connectivity among emotion-related brain regions during short-term memory in Alzheimer's disease. Neurobiology of aging, 31(5), 780-786. 1 2 3 Thaut MH, Peterson DA, McIntosh GC (2005). "Temporal entrainment of cognitive functions: musical mnemonics induce brain plasticity and oscillatory synchrony in neural networks underlying memory". secondary. Annals of the New York Academy of Sciences. 1060: 243–54. doi:10.1196/annals.1360.017. PMID 16597771.